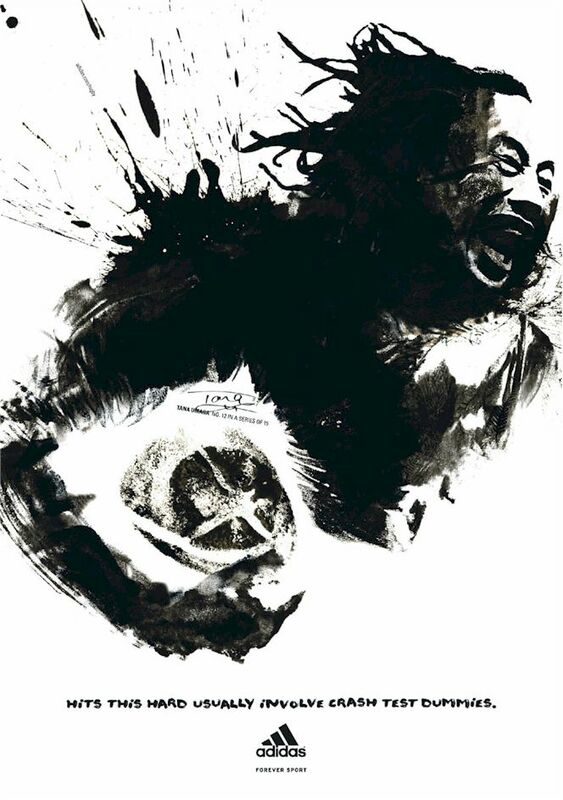 The 2003 print Epica d'Or award was won by 180 Amsterdam's press and outdoor campaign "Impact" for adidas international in support of the Rugby World Cup 2003. Graphic Designer and Art Director Stuart Brown joined 180 Amsterdam in September 2001. Stuart, a keen rugby fan and ex-player himself, received the brief which basically asked how adidas could make an impact during the upcoming Rugby World Cup. 180 took that quite literally and Stuart started experimenting on how to visualise the collision between 2 rugby players. He came up with the idea of covering players with paint and getting them to charge canvas-wrapped tackle-bags. In a friend's apartment the first attempt involved using poster-paint with a rolled up mattress serving as a tackle-bag. Not hindered by the ins and outs of body painting, they never thought of using a barrier cream to protect their skin. Stuart Brown says: "Two hours of scrubbing under the shower was followed by two days of migraines and the conclusion that poster paint is pretty toxic." For the second test they enlisted the cooperation of an agency intern who got covered in acrylic paint, which resulted in an inner-ear infection. They did get it right in the end using Vaseline as barrier cream together with proper body paint and this technique was used when the world's best rugby players gathered in a fully equipped photography studio in London to make their self-portraits. An additional portrait session was organized in Auckland, New Zealand at the request of the entire New Zealand All Blacks team. This time instead of individual portraits a 35 meter canvas was made with the impressions of 30 All Black players, which was then exhibited in Auckland's airport throughout the Rugby World Cup. The original impressions on canvas, were exhibited to the public in Dublin's Guinness Storehouse and later travelled to New Zealand. These canvases of and by 14 of the world's elite rugby players were then turned into 14 different print and outdoor posters. Each execution focuses on a different insight or aspect of the player's performance, which a true fan, teammate or opposing player would recognize and respect. The entire 'making of' the canvases was filmed by 180 and turned into TV commercials, which ran on TV stations that broadcasted the World Cup Rugby matches. New Zealand All Blacks player Kees Meeuws said: 'Basically you are leaving your imprint, like a fingerprint. It shows that rugby is a contact sport and that when you do get hit, you definitely feel it'. 180 Amsterdam's Executive Creative Director Peter McHugh concludes: "It's not an ad that talks at you - it's an art exhibit that becomes advertising. It comes at people from a place they don't recognize as advertising. The adidas "Impact" campaign won the first Epica d'Or for print advertising in a final run-off against the PlayStation "Supermarket" ad by TBWA\Paris. It marked the second time that 180 Amsterdam has won Epica's top honours with its work for adidas. Talk about suffering for your art: when 180 art director Stuart Brown had an idea for an adidas rugby campaign, he decided to test it out at home first. So, he covered himself in black poster paint, wrapped his mattress in cellophane, stuck on a sheet of paper and charged. "The results were pretty good but I had a migraine for a day and it took two weeks to get the paint off," he remembers. Nevertheless, Brown's efforts persuaded the client to go for an idea, which has ended up winning this year's Epica d'Or for print. "Adidas asked us how they could make an impact during the Rugby World Cup - we took that brief quite literally," remembers Alex Melvin, partner and head of strategic planning at the Amsterdam-based agency. Like most other sports brands, adidas is often seen as a company that just make shoes you can do sport in. But, Melvin believes, the truth is that they're more of a multi-specialist. "They've been involved in hundreds of sports at highly technical levels," he says. "So we were quite keen to drill down a little bit deeper knowing that as a brand they're inside the sport working with players: they'll develop different boots for forwards and for backs, different shirts depending on the player and his position. We wanted to do really impactful stuff but also be insightful of the game, demonstrating that this brand is one that understands the players and their capabilities." The resulting concept was to cover adidas-sponsored players in paint and ask them to hurl themselves at white canvases. Hopefully, the resulting marks would convey the power of the game and its athletes, putting the viewer in the midst of the action. These images would then form the artwork for the brand's major campaign around the tournament. Having convinced the client, 180 then had to persuade 15 of the world's top rugby players to have themselves covered head to foot in paint. Eventually, they managed to gather the whole of the New Zealand All Blacks team, plus assorted adidas-sponsored players from other countries, in a studio near Wimbledon dog track in London. The players were covered in Vaseline and a special body paint, then given ear plugs (another of 180's "testers" had unfortunately developed an ear infection during the early trials). They were then asked to run at, dive on and tackle canvases held by team-mates. "What we really wanted to know was, when you get two huge guys, and they go 'whack!' what does that feel like?" says Brown. "This was a way of recording the moment but also the scale of the impact as well." The agency also got the players to adopt a particular move or position which they were associated with. When the English players got their turn for the campaign, Martin Johnson jumped against a canvas as if catching a ball in a line-out while Jonny Wilkinson went for a mid-stride profile as if just about to kick the ball for a conversion. "There's a few of Jonah Lomu doing his classic hand-off move," adds Brown, who was impressed with the way the session brought out the artistic side in the All Black star. "Kees Meeuws and Jonah were telling us that they were both going to do foundation courses at art college," says Brown. "Kees actually went and did it while Jonah left to go and play rugby. Kees was directing Jonah and we just stood back and watched the two of them get on with it." Peter McHugh, partner and executive creative director on the campaign, believes that this close relationship that the players had with one another was one reason why the campaign came out so well. "They were all very cooperative with each other and you can see it in what we made. People get to a certain level at something and they all appreciate what each other does. They wanted to make the most dramatic prints they could." Extra details on the player's faces were obtained from stock footage and subtly added in post to strengthen the images. And what originally began as a poster campaign grew organically to include TV commercials, giant bus wraps, a calendar and, something the team were particularly excited about, a touring exhibition entitled Impact: The Art of Rugby with an accompanying art book to be published in the UK, Australia and New Zealand. "We tried to tap into a particular aspect of each player's performance that the knowledgeable fan would respect about them," says McHugh. "What it was about the player that's unique or special. Some are truisms about rugby, while some just acknowledge the fact that this is not a person that you want to get in the way of." 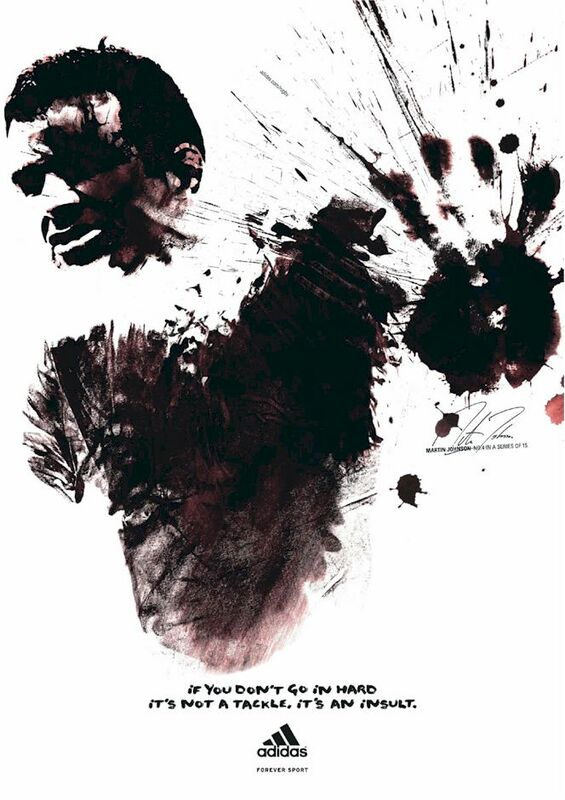 The finished work is an innovative spin on the tired world of the sports celebrity endorsement: in this case each athlete was actively involved, donating their own image as a unique self-portrait. It was that rare thing in advertising - a generally original concept that perfectly matched the brand and really connected with consumers. A campaign with real impact, you might say. Patrick Burgoyne is the editor of Creative Review.